Boosting, jumping, flying, failing, boosting again, hitting the ball, scoring a goal, explode and then all over again. That is Rocket League in one sentence. 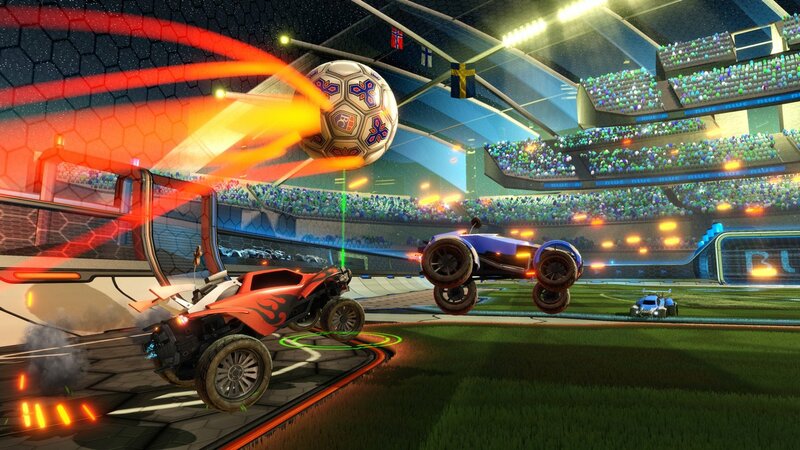 Rocket League is currently dominating PSN and STEAM and with these Rocket League tips you will be a pro before you know it. Rocket League is one of the free games of July with Playstation Plus. If you haven’t downloaded it yet, try to real it in. If you already but you have difficulty to master the game, then please read along. Following the next five tips will make better before in Rocket League you know it. Doing so, you will level up fast and you can match yourself with even the most fierce players online. Pressing Triangle on your PS4 controller will activate your ball-cam. With this, you will solely focus on the ball and makes it a lot easier to hit. Be careful however, when you’re in this mode, to not lose oversight of where you are on the battlefield. Always keep track of where you are in position to your own goal. Escape the ball-cam mode again with pressing the triangle again. Boosting towards the enemies goal is an awesome thing to do, but it’s also important to save some. When an enemy player breaks free and charges for your goal, you will hit yourself for the head when you’re not on time to stop him/her because you don’t have a boost. Trying collecting the big spheres, these give you an instant 100 points of Boost. Sometimes it’s important to not chase the ball, you will only block your teammates. Have some faith and stay a little bit back. This way you can save the ball whenever an enemy breaks out or charge for the goal once he’s in your line to hit into the goal. But remember what I said at tip 2., don’t use up all your booster if you decide to charge at the enemies goal. This will requires a lot of practices, but try to fully use your jump capability. Jumping helps to block a ball, to score a goal or to block an enemy player. It can even help you to get across the field faster. Try timing your jump in air while holding the control stick forward. Once you hit the air you can jump again, this way you can skip a lot of terrain and get somewhere else real fast. Combine this with “smart boosting” and you will be flying over the field like a Snowspeeder over Hoth. This might seems like a “Duh” thing to say, but believe me it’s a good one. With the offline mode you can easily level up and unlock all kinds of thing while getting better in the game with every duel you play. The game can become very serieus, but it’s also the perfect party game. Playing this game with friends will keep you up for nights, these nights are a lot of fun but also give you a lot of experience at the same time. Rocket League tips and you? I hope these tips help you to master the game. Because when played right it’s an epic and fun game. P.S. If you need Fallout Shelter Tips, I’ve got them for you.